Sierra Winkle was born and raised in Tucson. 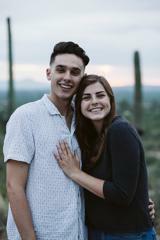 She played volleyball at Sabino High School as a setter/libero for four years. Additionally, she played club for Zona for five years, earning a scholarship to play college volleyball as a ds/libero at Chadron State College in Nebraska. Sierra is currently working on her degree in anthropology at the University of Arizona. She married Ethan Malis in November 2018. Sierra has been coaching with Zona since the 2017 club season.